The Glory 1-Light pendant light brings a simple, yet classy sophisticated look. 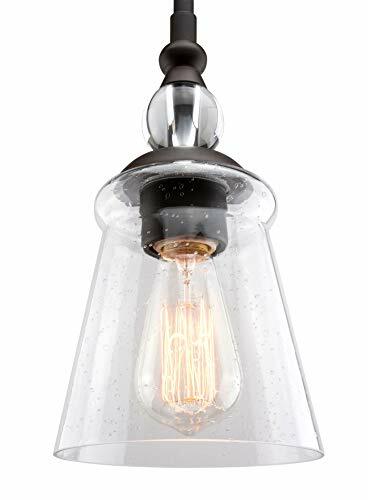 This retro style ceiling pendant light features a clear Bubble Glass shade, decorative glass ball and oil rubbed bronze finish that works well in settings like kitchens, dining rooms, cafes, restaurants, bars, or clubs, and with almost all design styles / interiors. With its optional downrods, this fixture can be used as down a hanging light as a semi flush ceiling pendant. DIMENSIONS: Shade Dimensions: 6.25" (H) x 5.5" (D), Canopy: 0.75" (H) x 4.75" (D). Adjustable hanging length: 13.25" - 55.25"